Dos Device Inspector is a small software utility to map Dos Device Symbolic Links to their native NT paths. Windows Object Manager uses these for physical hardware such as CDRoms, USB devices, Hard Drives etc. With this tool you’ll be able to see that the logical drive letter C:\ maps to \Device\HarddiskVolumeXxX along with many other interesting Dos Devices present in your system. Drivers that communicate with usermode will often define and create their own Dos Devices as well, they will be listed too. Get a list of logical and physical drives with this simple tool, properly obtain a list of all existing MS-DOS device names. Compatible with all NT-based Windows operating systems. 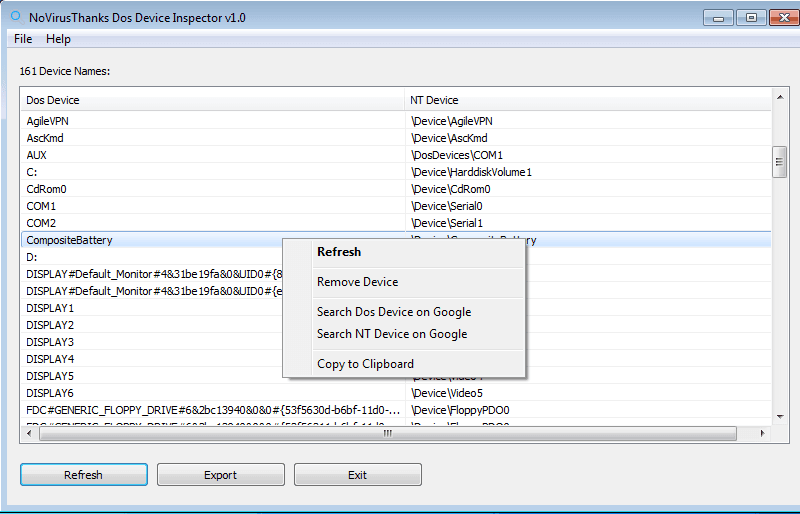 This tool is geared towards developers that want quick device lookups or those that like to explore their machines for possible malware remnants. You can also quickly export all the information about mapped dos devices to a custom log file for further analysis. Moreover, you can also remove a Dos Device (use with caution). This tool properly obtains a list of all existing MS-DOS device names. This tool maps Dos Device symbolic links to their native NT paths. Find out what logical drive letter is mapped to DeviceHarddiskVolumeXxX. Geared towards developers that want quick Dos Device lookups. View detailed information about every Dos Device present in the system. There is an option that allows you to remove a Dos Device (use with caution). You can easily export the list of all found Dos Devices on a text file.